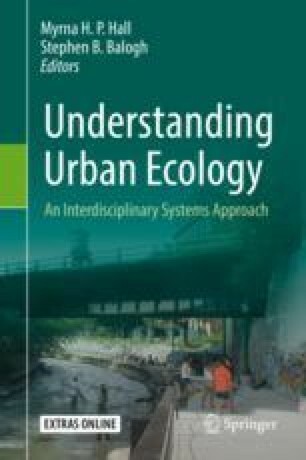 This chapter highlights some of the features of nutrient flows through urban areas. Cities represent foci of human activity and are thus centers of resource consumption. Anthropogenic contributions of nutrients (mainly nitrogen (N) and phosphorus (P)), and especially their consumption as food in urban areas, are associated with nutrient loads in human waste, which is channeled to waste treatment facilities, to landfills, and, ultimately, to the regional environment. Other significant contributions include atmospheric N deposition associated with industrial and vehicular combustion processes and N and P fertilizer applied to urban lawns and gardens. The concentration of these nutrients in urban regions, combined with their rapid movement in water flows facilitated by the impervious surfaces and drainage networks of cities, results in high nutrient loads to local and regional waters. Intensification of storm events in future climate scenarios should exacerbate potential nutrient flows from cities. High N and P loads, especially when out of balance with other nutrients such as silicon (Si), represent problems for water quality management. The online version of this chapter ( https://doi.org/10.1007/978-3-030-11259-2_9) contains supplementary material, which is available to authorized users. I thank Karin Limburg for her careful reading of the manuscript and her suggestions, which improved the final version.